May buy any quantity. May redeem 1 voucher code per checkout. This voucher only valid for the Blacklight Bubble Party in Ogden, UT on May 9, 2015. This event is nonrefundable. No full or partial refunds are given to customers who miss an event. Purchaser may change the name of the individual retrieving tickets up to 24 hours in advance of event. Prices increase closer to race date. Entire value must be used in 1 visit. Valid through: May 9, 2015. See the terms that apply to all deals. Are you ready to be transported into a fantasyland of bubbles, blacklights, and pumping music? Get signed up for the Blacklight Bubble Party 5K. 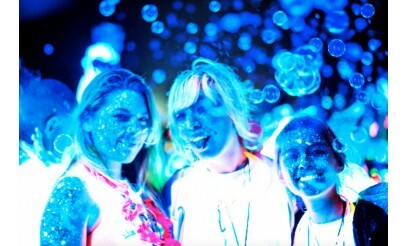 Run, walk, or dance your way through our blacklight bubble zones pumped up with popular groovin’ dance music. This race takes place on Saturday, May 9 at 8:30 pm. Only VIPs will be granted backstage and on-stage access, plus early access to the start chute and a separate VIP area at the finish celebration. 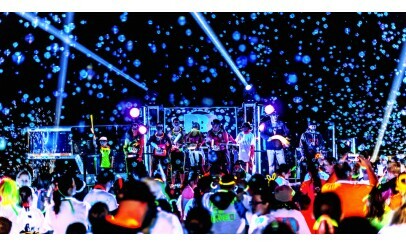 The Blacklight Bubble Party 5K is a fantasyland of bubbles, blacklights and pumping music. This family friendly event is handicap accessible; wheelchairs, strollers, crutches – arrive at the finish line party in whatever style you like – just make sure you arrive ready for more fun. The 2.5K option will bring you through 2 bubble zones. Participants will be greeted at the finish with a concert atmosphere complete with music, lighting, and of course, enough blacklights to cause satellite interference.